Registration is in the picnic field at Flatford Mill. The start of the swim is opposite the Boathouse Restuarant at Dedham Mill. The Dedham Vale Mill 2 Mill Swim isn't a race. 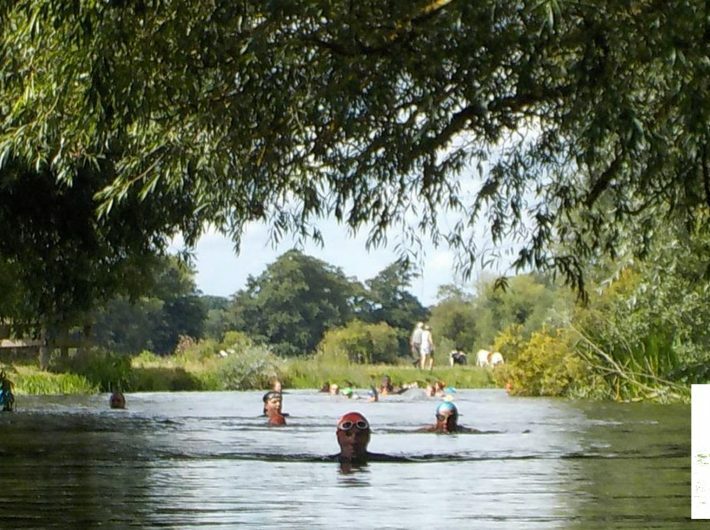 It's a social swim and a picnic at Flatford Mill, in the heart of idyllic Constable Country. The only difference is to get to the picnic you have to swim from Dedham Mill 2.3km away. The Mill 2 Mill is part of the Slow Swimming campaign, aimed at encouraging swimmers to take their time and enjoy the opportunity to be out fully immersed in nature. There are no timing chips or results sheets. Everyone who takes part is a winner equally. We are very keen to get children used to, and enjoying, swimming outdoors. This will improve their safety in and around water and should encourage them to be lifelong outdoor swimmers. There isn't an age restriction as such, but obviously we would be depending on your adequate supervision of anyone under 16. I would very much recommend that they wear a wettie, as children lose heat quicker than adults when in water, and unless they are very good swimmers a form of buoyancy aid. To give everyone an enjoyable swim the event is split into waves. Each wave will go off at twenty minute intervals from 10am, but exact start times will not be known until nearer the time as some waves may be split into two to stop overcrowding in the river: Wave one: Seriously Need More Cake (Known as Serious), start at 10.00am. Choose this wave if you would like to actually race, but be prepared for a bit of a scrum in the narrow sections. Wave two: Relaxed 'cause we know where the cake is hidden (Known as Relaxed). Steady pace - no rush. Wave three: Enjoying the Journey (Known as Enjoying it). Sculling along, maybe with a bit of paddling, smiling and chatting. Wave four: Pooh Sticks. Basically it's for people who want to really enjoy the scenery and float along using floaty things (nothing bigger than a lilo please) and stick out the occasional hand or foot to paddle. It could be as little as arm bands or a rubber ring. BUT - please make sure it's both safe (won't go down and drown you) and won't damage the river or river banks. We are here to help look after the river!